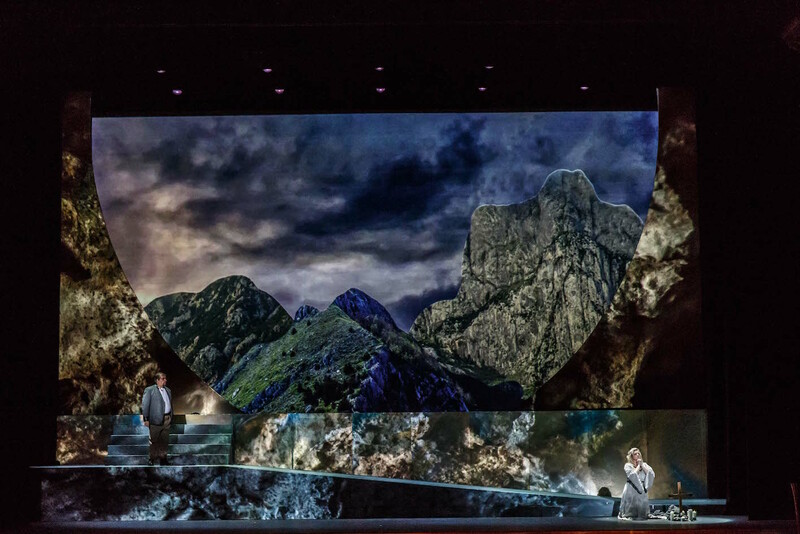 Melbourne Opera makes a quantum leap in scale of production, crossing Collins St to present a majestic, immensely satisfying production of Tannhäuser at the Regent Theatre. Achieving a synergistic if-you-build-it they-will-come vibe, this second performance of Tannhäuser was extremely well attended, surely coming close to the 1300-strong audience at Sunday’s premiere. 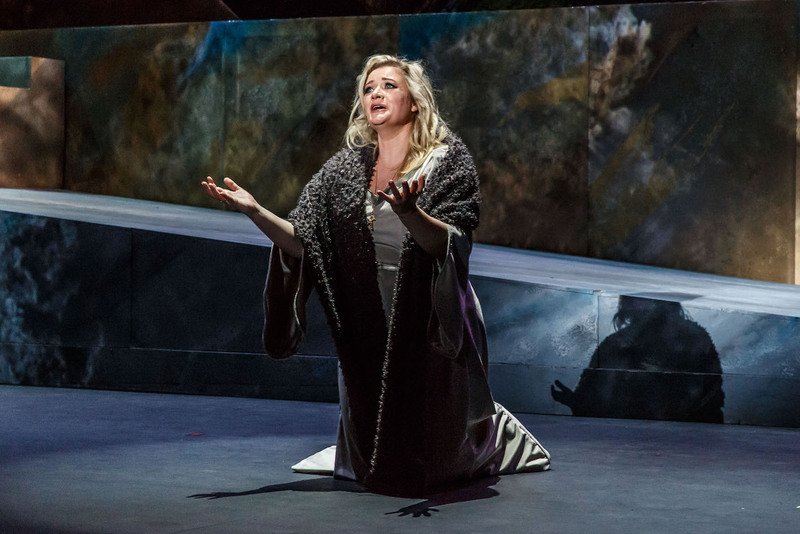 The ranks of Melbourne Opera’s followers have clearly been swelled by fellow opera lovers keen to experience Wagner’s epic romantic drama in its first Melbourne appearance in over 20 years. 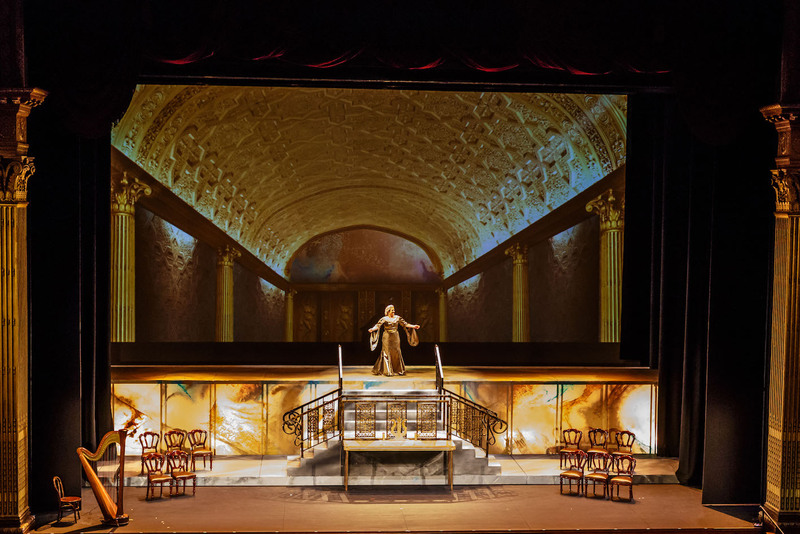 Free from the clutter of overladen commercial-scale lighting bars, the Regent’s gilded proscenium arch makes a majestic frame for the handsome production. As the glorious music flows and crescendos, the sound is matched visually with the beginning of Zoe Scoglio’s stunning video projections. Crashing waves ebb and flow in a hypnotically symmetrical design, all the more beautiful for the realistic, rather than computer-animated, look. The waves slowly give way to Venus’ cave, erotically created from an overlapping multitude of female forms. Act two’s Hall of Song is a gleaming static image that matches the Regent’s interior beautifully. Set designer Christina Logan-Bell provides a streamlined canvas for the projections, providing striking depth with circular edges framing the backdrop. Elegant ramps and stairs are painted in attractive faux marble designs, and the major stage platform has rear stairs that allow for dramatic entrances and exits. 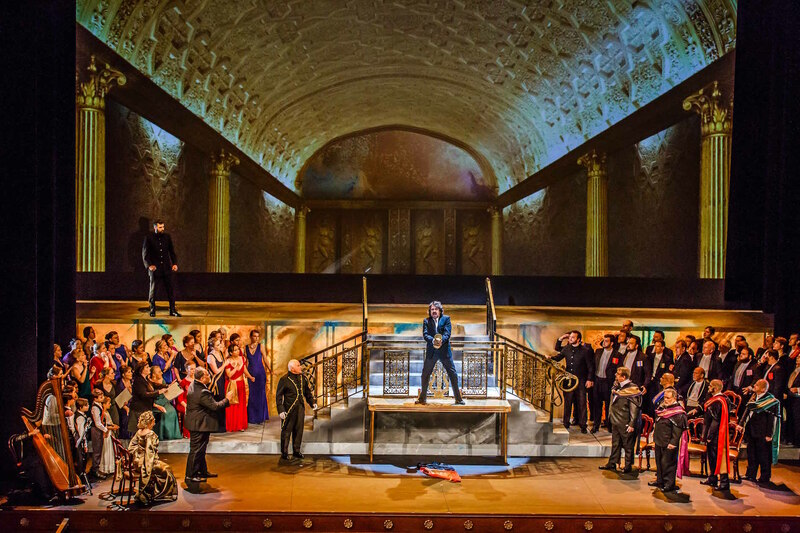 Director Suzanne Chaundy shows a clear and confident vision for the vast scale of the opera, maintaining interest throughout the long scenes with engaging business and passionate energy from the singers. Away from the cramped wings of the Athenaeum, the ensemble has the space to come and go freely. Chaundy fills the stage with singers, give them purpose and presence. While the principals sing in German, the chorus sings in English, expertly prepared, as ever, by Raymond Lawrence. Guest conductor David Kram presides over more than 50 players in the Melbourne Opera Orchestra, producing a fine sound that benefits from the acoustic quality of the auditorium. 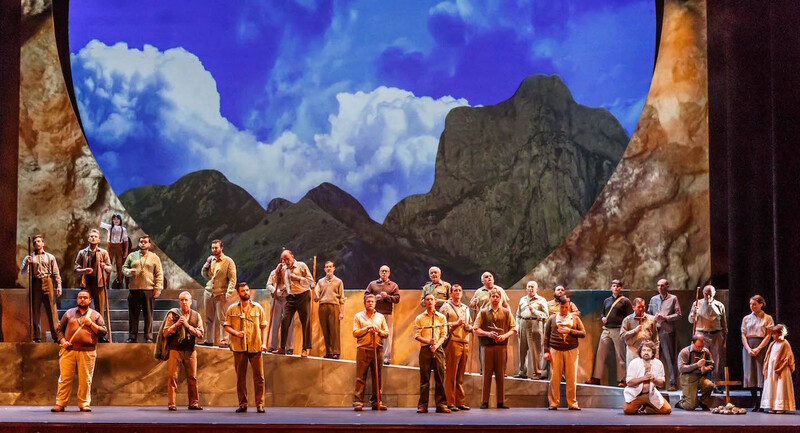 Costume designer Daniel Harvey initially dresses the chorus in neutral pastoral shades as noble pilgrims. The company sparkles jewel-toned gowns and dinner suits in act two, all adorned with matching gold sashes. Lighting the stage is deceptively difficult in the presence of projections, but Lucy Birkinshaw bathes the downstage area in warm overhead and side light, allowing the projected images to be seen in sharp clarity. With steely presence to spare, Romanian tenor Marius Vlad is sensational in the title role, singing with a tireless, heroic tone. Lee Abrahmsen is in full goddess mode as Princess Elizabeth, looking a million dollars in golden gown and blonde curls. This decadent look is contrasted with a humbler calico smock and ruffled hair as the heartbroken Elizabeth appears near death in act three. Abrahmsen’s voluptuous soprano sounds glorious in the space, and she creates a sympathetic, vulnerable character beneath all the glamour. Soprano Sarah Sweeting sizzles as seductive siren Venus. Manfred Pohlenz brings expertly measured authority to the role of Wolfram. A strong lineup of Melbourne Opera regulars delivers solid support, including impressive featured moments from Eddie Muliaumaseali’i, Michael Lampard and Jason Wasley. 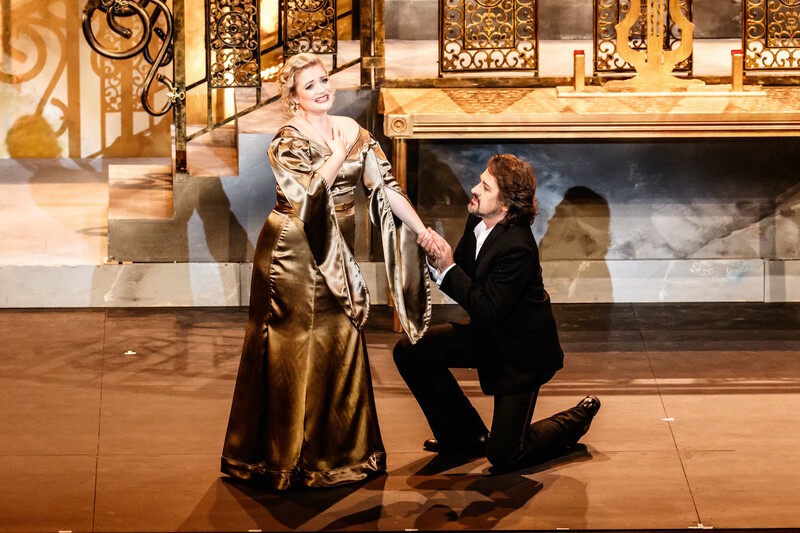 The combination of strategic stage positioning, crisp, well-matched costumes, rich, midnight blue lighting and glorious vocals results in a stirring, highly memorable conclusion to this wonderfully realised production. Tannhäuser plays again on 20 August 2016 at Regent Theatre, Melbourne, followed by a performance on 28 August 2016 at Robert Blackwood Hall, Monash University.